Master Jesus: I’m here gathered with you, dear brothers. Truly I say to you that all the acquired knowledge is useful as long as it’s used in terms of Love. Truly, I say to you that Service must be done in a completely selfless way, but is very important to clarify that the true selflessness lies on pure Love, on impersonal Love, on the Love which is offered completely, a Love that has no shortage due to the simple fact that it doesn’t need, a Love that is not mean because it’s offered one hundred percent. On the other hand, dear brothers, it’s important to understand that curiosity is a guarantee for the investigation and that it’s not wrong that you investigate on the physical plane for the benefit of your neighbor and, obviously, on your own benefit. I perceive a lot of indifference in many beings, who live their lives routinely, without the passion. Brothers, you will tell me that passion is part of emotion as well. Johnakan, my beloved disciple, said that emotion is part of the ego. On the physical plane, sometimes a spark is needed to ignite a flame. In the flame of Love, even being the love I’m referring to- pure feeling- perhaps that spark is emotion, but it doesn’t mean that the flame that is lit afterwards contains emotion. Then. That passion is what overcomes the inertia of procrastination, of reluctance, disinterest. Everything that is balanced is okay. Interlocutor: We would go to the beginning of the engram related to the crucifixion. You will see where the incident starts and we will go through it. You already know what a psychoauditing is: I beg you to tell us all the details in order to eliminate not only the conceptual engrams, but also because it’s a historical fact. Master Jesus: When I was a child, in that incarnation as Jesus, I had a lot of knowledge, but I was very cautious. I remember when I met those people who you know as "the doctors of the law." I showed my human side to them; first of all, I never tried to be arrogant. I always kept - as you say- a low profile. It’s not true that I confront them; I simply held an opinion about my point of view. And they were admired by the fact that in spite of my short age I could talk about so elevated topics. Interlocutor: How old were you? Master Jesus: I was eleven to twelve years old. I had many concerns and my biological mother, Mary, advised me a lot. She was a simple spirit with so much love, but with too much attachment, and his spouse, Joseph, loved her in a beautiful way, even knowing that I was not his biological child. Joseph accepted me and raised me as much or more than his own children he had from a previous marriage, obviously before he became a widower, because he knew that there was a lot of 'money' in me to take advantage from. Interlocutor: What you are saying, Master, Does it have charge or it’s a prologue? Master Jesus: A prologue because he had a feeling that I was destined for something more than being a carpenter. Joseph, in his lovely availability, taught me the best he could his occupation. And I learned it as well as he did. With mother I was different because we had talks about love. She was very- I don’t say strict-, but she was very attached to her faith and we had great debates- sometimes we had strong arguments. But I, being small, had no authority to argue with her. - Mother, God created us, but it’s not true that we have been created in his image and likeness. God has created us, and we are part of His manifestation. God is the purest Love that can exist, and God does not judge us or punishes us. That hell you talk about, I don’t accept it from your point of view. - You're too young to understand. - No. We all understand since we are born, ever since we acquire vocabulary and our personality is developed. This is not our only life. - But what are you talking about? The years passed by. I’m not going to narrate the experiences I've had in other regions. Interlocutor: It's essential to go to the incidents that have charge, Master. Master Jesus: Yes, at the Jordan river he poured water over my head. At that moment I felt a mental clarity, a beautiful Energy that invaded my whole body, and filled my arteries of life ... My understanding was enlarged. Interlocutor: Like an expansion of consciousness? Master Jesus: Let’s say that it’s like I embraced everything and that's when I channeled the Christ Energy. This Christic Energy that gave me the understanding and made me feel certain apprehension. There was like a sort of fear to exposure. I felt more exposed when I was eleven or twelve years old, when I talked to the "doctors of the law", but in turn, there was like a flame inside myself- that compelled me to reveal the Word. But I needed ears. Interlocutor: How old were you when you were baptized? Master Jesus: I was significantly older. I was about thirty-one years old at that time. Interlocutor: You were closer to the crucifixion. Please, Master. Continue. Master Jesus: I was looking for and talked to many people, explaining to them what the Kingdom of the loving Father truly was. There were about thirty people who followed me, but later on some of them didn’t want to leave their jobs or family commitments, or they were too attached to their families, they were staying. Finally only twelve people followed me, those who you all know through the scriptures. Master Jesus: ...due to his ego. However, nothing was going to stop me to spread the Word. And I had internal fights due to the same expanded understanding because, although we know that fortune-telling doesn’t exist, there was an assumption. Interlocutor: We could say speculation. Master Jesus: Then, I had the apprehension of the future -although not exactly, and I knew what I was exposed to in a region so fundamentalist, where there were religious people that would call me an outcast if I missed a comma of the word. On the other hand, there were the Romans, whose only interest was to maintain the order because if there was any insurgency, the leaders were going to be punished. Then, at the slightest turmoil or any insurrection in any village, they imposed order by the sword. Interlocutor: So it was a kingdom of terror, in some way. Did they live in fear? Interlocutor: Was there like a danger for those people who were separated from the traditional life-style of the region. Master Jesus: That was me. Interlocutor: Exactly. Master, before you continue I have a question: How tall were you? Interlocutor: Ah! You were a tall man! All right. Master Jesus: I had a dark complexion, brown hair and aquiline nose. Interlocutor: When you say dark complexion Do you mean black? Interlocutor: Dark-complexioned. A tone between copper and... Well, Dark complexion. All right. Go on, Master. Master Jesus: He wanted to organize an uprising, to such point that many historians see me as a social organizer. I’m Sorry to tell them that my desire was that they understand that there was a Kingdom beyond the physical realm. If through that word many took it as a social organization- That’s their problem, but that was not my desire. It’s true that I had several arguments with Mary, my mother, because she didn’t have the expansion of consciousness I had, but she had the mother's intuition that I was in danger. However, I was exposing myself to that and I knew that there was a limited time, as you would say today, in which the gunpowder would explode. Interlocutor: Don’t forget to go to the charge, Master. - He knows Caiaphas and many people of the Sanhedrin. We've heard him mutter. - I know, dear brothers. - But, Lord, then why…? - Because everything that has to be, will be. Because it’s written. - Nothing is written, Master, everything is to be done. - Simon, I understand what you mean, but my very understanding tells me that what I must do is to transcend. - But Master, you taught us that Service is transcendent and not sacrifice. - Oh, little one! How many reprimands I have given you over these years? You're not a 15-years-old boy... You're a boy of about eighteen years old, and you're a man. If you understand that, you also have to understand my point of view. Do not be so attached. - I have no attachment, Rabbi. I have love. - It’s Not enough, dear John- if you have love only for me. Look at your brothers; look at the brothers outside, look at those who stretch out their hands to help others. They are also your neighbors. - I know, Master, I know. I learnt by heart the parable of the Samaritan; your neighbor is the one who raises the fallen. - Apply that, John. If you have Love, that Love should not have a direction. I remember being in the garden of Gethsemane. It was late. John wanted to stay with me. I let loose his hand of my arm. - I want to be with you. - Let me think. Go and rest a while, like the others are doing. - I Just don’t want to sleep. I want to be here. - I need to rest. If you consider me your Lord, listen to me. Lie down. And I stayed alone leaning against a large rock. I heard footsteps. I thought it was John, but it was Peter. - Master, I’m convinced that at any moment Judas is going to show up along with the Sanhedrin. They want to arrest you. They are going to lock you up and they are going to execute judgement upon you. We can cross the Jordan river and go to Damascus. - It’s true - I thought- I know what the Romans do and I know what the torture means. But no! Interlocutor: You were losing strength. Master Jesus: ... My ego was making me think that Peter was right. I contacted with my father, mentally. - What is your will? - It’s not my will, it’s your will. - What is my will? - You yourself know that. - What are the steps that I should follow? What should I do? I’m really scared because I have to suffer on the physical plane. - But, Father, I’m part of you. - But son, that is somehow wanting to get away from your responsibility. That would suggest that I’m ordering a sacrifice from your part and you know that there is Free Will. It’s your will to be done, not mine. - I'm sweating, Father. I feel my clothes wet... I think I hear footsteps and voices in the distance... Is it my imagination? Father! But my same role of ego was preventing me from contacting with the Father. And of course it wasn’t his will, it was mine. It wasn’t "Thy will be done, not mine," but the opposite: "It was my will and not the will of my Father"
Interlocutor: Did you sweat drops of blood? Interlocutor: Then. That's a mistake from the Bible that mentions drops of blood? Master Jesus: At that time I had hypertension, heart-throbs, tachycardia and that could have affected some capillary veins. And yes, on my forehead there were small drops. - Yes, John. -And we hugged each other- John, you have too much to walk. Don’t be like the others who deviate from my path. You have to continue with the mission. They all were awake. Finally Judas came along with the Sanhedrin. There was an attempt of resistance on behalf of Peter, but I stopped it and I went with them. I said in another occasion that Peter didn’t deny me three times. He’s got to deny me six times, but he was an embodied human being. And, as the Thetan of my beloved disciple says: "The physical plane is like a gravitational well that pulls you down," I understand and since I understand I don’t judge. Interlocutor: Tell us that incident thoroughly, Master, in order to remove all the conceptual charge. Master Jesus: In my whole body I was well-fed and well-cared for, I didn’t know about diets. In meetings, around the bonfire, I used to drink wine, I ate lamb. I was not in favor of a particular diet, but my body was strong. Interlocutor: How long did the flogging last? Interlocutor: Ah! Were they long hours? Master Jesus: Hours. It’s very hard for me to narrate it. Interlocutor: It’s important that you do it in order to discharge it. Master Jesus: I can only say that on my way to the Golgotha, ​​carrying the log, my mind was so elevated that I almost felt no physical pain. However, I had a tremendous emotional pain for those who were looking at me from the sides of the road; they looked at me with scorn and contempt, they were the same people that long ago made a path of flowers for me. Interlocutor: Did they spit in your face? Why don’t you understand? Who do you want to pay lip service to? Do you think the Romans will applaud you for throwing stones at me? By showing those faces? They are faces! The Romans will not care about you! Interlocutor: Master, I will ask you a question: What was the purpose, from your point of view- that all what was happening to you, all that suffering? Did you have the idea that your doctrine was going to transcend really? Interlocutor: Was that the particular reason? Master Jesus: I wouldn’t say routine. Their lives were rich, but once they disembodied their words were lost. Interlocutor: Was there a single nail in your feet? Master Jesus: Yes, because They put one foot on the other. Interlocutor: Did you have a wood block for your feet? Master Jesus: Yes, I had a support. Interlocutor: Okay. Was it a common cross? Master Jesus: No. It was a log which they stood up and formed what you call a cross. At no time I carried a cross. Interlocutor: Okay, I have a drawing here. Master Jesus: Sure. But the horizontal beam was not continuous with the other beams of the other two people who were at each side. 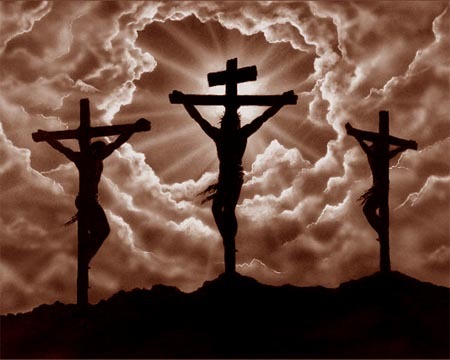 The logs were independent; that is, there were real crosses. Master Jesus: There were three independent crosses. It was not a long horizontal log with three vertical beams. Interlocutor: I understand. But in this framework that I have here... It seems that the log was protruding. Master Jesus: I'll explain it to you, dear brother. Interlocutor: I understand. But it was protruding, we would say. Interlocutor: Okay. Master, How much distance was there between your feet and the ground? One meter? Two meters? Do you understand the question? Master Jesus: Approximately one meter. Master Jesus: It wasn’t so high. About one meter. Interlocutor: I asked this because there are pictures where you appear very high. Master Jesus: No. the beam was a stake of just over three meters. Think: if the log would have been longer, the log should have measured four meters and it wasn’t so long. Interlocutor: I understand. Were you completely naked? Master Jesus: No. I had what you call a loincloth. Interlocutor: A loincloth. All right. Master Jesus: I had a crown of thorns. Master Jesus: I’m sorry to disappoint you, but there is not so much to tell. Master Jesus: The suffering, the lashes, the skin was dripping blood... My face was almost of vermilion color due to the blood of my forehead. It is a repetition, because for hours it was a similar punishment. What hurt me the most was the big nail in my feet. Interlocutor: Okay. I mean, the wood block on which your feet were supported had the purpose that you don’t fall or be torn? Or was it some kind of torture? Master Jesus: It was there to support me. Interlocutor: I guess that the more you would last on the cross, the more suffering you would have. Interlocutor: Were there three nails? Master Jesus: Yes, they took out the ropes, because first they had me strapped the forearms and a there was a single string on my feet. Interlocutor: But obviously you made no attempt to escape. Master Jesus: No. I had no physical or mental strength to do so. Interlocutor: Master. How long did it take you to disembody? Master Jesus: Approximately three hours. Interlocutor: Ah! Not an hour and a half as many people say. Interlocutor: Anyway I understand that there were some people that have lasted up until nine days... or not? Master Jesus: No. With such torture, no. Interlocutor: So, it’s said that some people lasted four days. Or not? Master Jesus: It depends on the torture and it depends on the physical condition. Interlocutor: But, in general, you lasted for three hours because you had suffered the flogging? Interlocutor: Okay. Master, which was the biggest torture? The asphyxia? Master Jesus: The biggest torture was in my whole body. Interlocutor: Let's see, Which part of your body was causing you more suffering? Master Jesus: My feet, mainly. Interlocutor: Even more than the asphyxia? Master Jesus: Yes, my feet, mainly. Interlocutor: I’m surprised because I thought that asphyxia was the most terrible thing. Master Jesus: I felt like a weakness but I was conscious. Interlocutor: Were you three hours lucid? Interlocutor: Was she present there? Interlocutor: Who were present with you at that moment Master? Peter? Master Jesus: John was there. The only one of my followers. Interlocutor: Afraid to be captured. Interlocutor: Let's see... Mary Magdalene, your mother Mary and John were there. The three? Master Jesus: And another Mary, who had offered me hospitality in her house and who had scented me. She was also there. Master Jesus: And I told John to take care of my mother. Interlocutor: Could you talk at that time, in spite of the suffering? Master Jesus: With softly voice. That was at the beginning, practically. And John nodded. This is not to detract my three siblings, but they had their commitments, and I felt that… I could understand that John could take care of her better in the few years remaining she had. And I know he did. Interlocutor Master, at some time you left your body as if it were a kind of astral trip? Interlocutor: At no time? Were you clung to the suffering. And the cramps? Master Jesus: Tremendous cramps. The muscles, which then became like rocks, the tendons... I wanted to move and I couldn’t. I wanted to fight and I couldn’t. Fight the pain, I mean, not to get away from what was happening to me. Interlocutor: Okay. How about the spear in your side. Were you already dead when the spear stabbed your side? Master Jesus: No. That was almost at the end. Interlocutor: Did you feel that? Interlocutor: Master, what conceptual pain is remaining from the flogging and the three hours you were hanged on the cross? What pain is left? Interlocutor: I mean, in spite of the physical suffering, the greatest suffering was caused by the forced abandonment you were going through. Master Jesus: Yes. Absolutely. That’s the greater engram, much greater than my suffering, which was very much, and you know that. Master Jesus: No. I have no conceptual charge. Interlocutor: So, let's see... The little charge you had, Was it discharged with this story? Interlocutor Master, hold on a moment. I just have a question to ask you. How many Psychoauditing sessions will be necessary to remove all your conceptual charge? Master Jesus: It’s not necessary, dear brother. I really tell you that it's not necessary. This lack of understanding is not an engram; it’s an incomprehension that any good person can understand. This vessel that channels me, who is the 10% of my beloved Johnakan, also understands that a smile, a fresh dialogue and to stretch the hand out to help other people is more fruitful than the barren indifference. Interlocutor: Well, Master. Listen to me just one moment... When you disembodied. Can you tell me what you felt as a 10%? Master Jesus: I have never thought of myself as a 10%, in the sense of attachment to a role on the physical plane. Interlocutor: I was referring rather to your descent to the Eighth Sphere. Master Jesus: I intentioned that. Master Jesus: No. I disembodied at the moment of my disincarnation. Master Jesus: Yes, and as 100% spirit I wanted, somehow, to understand the suffering of the beings dwelling in the Eighth Sphere, where each one of them feel the conceptual pain of the others. Interlocutor: Okay, Did you have that need as a 100%? Master Jesus: As a 100% spirit. Interlocutor: Before of that you never went to the Eighth Sphere? Interlocutor: But if a spirit wants it, it can go to the Eighth Sphere like that? Interlocutor: So, when you descended to the Eighth Sphere, Was it an exception? Interlocutor: So, my Thetan, Radael, can’t do that? Interlocutor: Is there any other case you know about in which the Father also granted the descent to the Eighth Sphere? Master Jesus: Yes In another world, and in other circumstances. Interlocutor: Okay. Your descent to the Eighth Sphere was in a 100%? Interlocutor: Now, Did you know that while you were there you could have left that place at any time? Interlocutor: How long did you stay in the Eighth Sphere? Master Jesus: I didn’t measure the time because at that time I sought to convey Light. I wanted to grasp the spiritual concept of the spirits in there, and explain to them that only by perceiving the suffering of the others they could escape from the pain and ascend to the Light... But my concept was not understood. Interlocutor: Okay. You were in the Eighth Sphere as a 100%, but Was your body dead? Or was it still alive? Master Jesus: My body was clinically dead, as you understand what clinical death is; otherwise I couldn’t be a 100% spirit. Understand that. Master Jesus: The fact that with a technology from another world I was resurrected, it’s another story. Interlocutor: We could say that It was like reincarnating. Interlocutor Master, before you leave I would like to state that while you were narrating your story, I had many questions to ask, just in case the people who will listen this session perhaps say that I didn’t ask many things. However, I didn’t ask because I didn’t want to interrupt your narration. I wanted to make that clear. I mean, Could we ask those questions in another session? Master Jesus: I give you all my Light, my dear brother. Interlocutor: Thank you, Master. See you later. This entry was posted at Thursday, November 24, 2011 and is filed under Biblical mysteries, Psychoauditing . You can follow any responses to this entry through the .